Pharmacology: Bupropion is an inhibitor of the neuronal uptake of norepinephrine and dopamine. It does not affect serotonin. Contraindications: History of seizures, recent head injury, current or past history of eating disorder, and patients current taking a class of antidepressants called MAO Inhibitors. Dosage Forms: 150 mg, 300 mg tablets. There is a 450 mg tablet sold under the brand name Forfivo. Dosing: Initial starting dose is 150 mg once daily in the morning without regard to meals. The usual adult target dose is 300 mg once a day (maximum recommended dose is 450 mg per day). 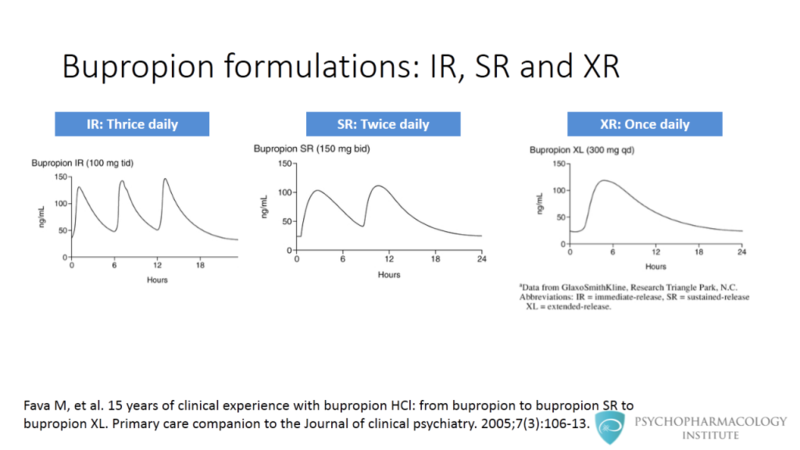 Bupropion for Adults with Attention-Deficit Hyperactivity Disorder: Meta-analysis of randomized, placebo-controlled trials. Bupropion in Adults with Attention-Deficit/Hyperactivity Disorder: a Randomized, Double-blind Study. Bupropion SR vs. methylphenidate vs. placebo for Attention Deficit Hyperactivity Disorder in Adults. An Open Trial of Sustained Release Bupropion for Attention-Deficit/Hyperactivity Disorder in Adults with ADHD plus Substance Use Disorders.